I’d say game week 7 was another hugely successful week. A return of 85 points resulted in a significant jump on the overall leaderboard, putting the team just within the top 10,000 teams in the game. At this stage in the season I’m fairly happy with this result. More importantly I’m also very happy with my team going into October which is another positive. There’s nothing worse than going into a new month thinking that three transfers may be required instantly. From looking at my team, I’m thinking that I probably don’t need to make any for the first week of the month. This should set me up nicely to make some more proactive transfers later in the month. This worked well during September, as I was fortunate enough to be able to take Mendy and Pedro out when they both had a spell on the sidelines. Clean sheet for Shaw in the Champions League and 3 points despite a heavy defeat to West Ham. Man Utd’s form is definitely a concern but given his price, I still think Shaw is a decent option given their extra games and the amount of game time he is getting. It’s hard to imagine that Man Utd will finishing outside of the top 6 teams come the end of the season so their fortunes must surely change soon. Clean sheet and another 3 points for Laporte making 11 for the week. This has been a successful transfer with Mendy currently picking up 0 points each week. Hazard with a goal and star man performance. He also gained 3 points for a cameo in the Europa League. Another successful transfer, although I’m still disappointed I missed the hat trick week. Maddison picked up 5 points which was a positive considering his value. Aguero is constantly picking up points with another 15 this week. Kane grabbed 25 points for the game week. I’m hoping these points are what has made the difference this week. Many people were considering taking Kane out based on his form. I wanted to stick with him in the hope of a big game week. Although 25 points isn’t huge, it’s enough to gain a good advantage over those who don’t have him. If he can start to consistently do this over many game weeks it could create a huge gap. Hart seems to be playing well at Burnley but I’ve still got a question mark next to his name. I’m fairly sure Burnley won’t have a season like that had last year and could even be drawn into a relegation battle. This doesn’t look good in terms of Hart picking up many points. Having said that, based on his value he may still get enough to justify a place in the team. B. Silva only managed 3 points across the game week, despite City having two fixtures. This is a slight concern as he didn’t start in the Champions League. Luke Shaw is a positive but also a slight concern. The concern being the way West Ham managed to score three times. Mane and Salah both appear to have had a dip in form, especially from a point scoring perspective. Due to the nature of the game, most people will now move from wanting to drop Kane to thinking about dropping Salah. Which I completely understand, however for me personally there’s a case for waiting a little longer. I believe Salah’s stats aren’t too dissimilar from this time last year so I’m going to be as patient as possible. Either way I’m giving myself another couple of weeks to consider this and also to evaluate what others do over the weekend. I’d like to get Kepa in but not sure I will be able to afford him. We will see what the situation is after the weekend. Great analysis as ever DTT. Can’t disagree with anything you’ve said there. I’m also looking at Leno as a keeper option as I like the look of Arsenal’s fixtures. I do think there is a fair bit of risk involved though as the defence looks far from convincing. The recent FFS scout notes from their Europa game also comment that FK Carrier Bag got through with ease at times especially first half. Leno however was able to keep them out when needed. Cheers Chris, I think I’ll leave the keeper situation until after the international break to give me some time to think about it and also to see what other people do with their transfers. That saves a potential headache for me. You’d think he’d be playing with Delph out surely? There’s a cynical part in me that wonders just how bad his ‘injury’ was and if the issue was more of a disciplinary one? I’ve read the rumour it was a disciplinary issue, but if that was the case why was Mendy joking on Twitter about costing fantasy league managers points?? Zinchenko has been filling in recently, but I expect Pep to thrown him back in. Yeah, I guess we’ll never truely know what the reasons were. I fully expect Mendy to start. I think it probably started with a small injury but he didn’t respond well to it. Rumours were that he was late for a session with the physio’s after being pictured in London for the boxing the night before so I’d imagine he’s been ready to play for a while. I’m hoping he doesn’t come back scoring big with an assist or star man. Haha I’m hoping for another decent game week – I still don’t regret holding those transfers despite missing the Hazard hat trick. Means going into the month I’ve got no injuries to worry about (at the moment anyway). Looks like you’re a step ahead if you’ve already got Leno as a lot seem to be looking at him now. When is De Bruyne likely to make an appearance? Not sure whether to keep hold of Pedro, looks like Willian is first choice, so to retain his services, subs appearances in league & europa league inclusion may not suffice, trying to also reign in funds, for the inclusion of De bruyne in November, so will probably take out Pedro for Maddison, does anyone think this is a wise move, wld leave me one transfer after international break Shaw out, & again to acru more funds Doherty in. Sounds like smart manoeuvring to me David. Leicester have good fixtures coming up and Wolves look like they can go toe to toe with almost anyone. Both players have been very impressive thus far. Yeah cheers Chris, think I’ll do switch, have already done Lukaku out Kane in, didn’t work out for me, DTT’s patience paid off, then Pedro to Maddison, leaving me Shaw to Doherty after internationals, as always a degree of good luck required on any injuries, I suppose you can be a little more patient with Mane if you have him, De bruyne inclusion on the horizon. Maddison seems like a good option for freeing up funds. I can’t say I really wanted to bring him in but he’s done well for me based on his value. Your teams looking good DTT, nice work and great blog as usual. I think Kane could be essential but it’s surprising how quickly things change – everyone was talking about taking him out a few weeks ago. I’d be tempted to agree with you in terms of getting him in as soon as possible. I’d be cautious about using all three transfers though. Is there no way of getting him in with just two? And maybe going for Doherty or Maddison to free up funds? I think this month could turn out to be the battle of Hazard vs. De Bruyne. Very few will have both, and most would have ditched KDB for Hazard. I agree with your comments on Salah. I took him out for September but will want to bring him back in soon. It will only take 1 or 2 game weeks for him to get back to the top of the leaderboard. I also like the Kepa, Doherthy transfer. Looks much stronger than Hart, Shaw. The one thing the team us missing is some Chelsea defensive representation. No need to rush into it, but looks a smart move. Just waiting for that week it clicks and Aguero, Kane and Salah all perform on the same week the we are in business!! Much more enjoyable this season – but that can all change so quickly. De Bruyne in the equation could make things very difficult. It’s making it harder to make a case for having both Salah and Mane when they’ve not performed much over the past few weeks. I’m hoping they bring De Bruyne back in slowly. I certainly won’t be rushing into trying to accommodate him. After transferring him in for Lukaku, please tell me Kane will score against Cardiff. Half an hour & more, Kane can’t even score against 10 men, JOKE. So disappointed he didn’t do more. Disappointing Spurs performance, wonder how much the Barcelona game took out of them. Cardiff are the only team Kane hasn’t scored against in Premier League ever. On another note, my team Mansfield concede a 95th minute equaliser for what feels like the 8th time this season! Argh! Yeah, brought in Doherty as well. Initially I kind of dismissed him but your previous comments Chris on him made me look at him again. Digging deeper, I was more impressed. I liked the fact that Wolves favour attacking from the right where Doherty is. Also happy that Doherty achieved one of those rare feats of clean sheet, goal and star man. Also it shows that the timing of transfers is crucial. So credit to Chris – the best contributor on this blog. Nice one RR, glad to hear you went for him as well. He’s been with Wolves in league one, Championship and now the Premier League. The sort of player who will run through brick walls for the club and allowed to bomb forward this season which always gives the possible dream scenario of attacking and defensive points. With Patricio performing superbly between the sticks too, he should do well. Very kind words RR but we’re all just cogs in what’s hopefully becoming a well oiled DT machine. Working together will help us all win those mini-leagues. Completely agree – credit to Chris for raising Doherty as a great option but also for the regular insightful comments. Should have made this transfer myself but at least Leno didn’t get that clean sheet. That’s the second time this season where I’ve considered making a transfer at the start of the month but held back to be cautious and it’s backfired. Doherty was the player I was going to bring in to allow me to change Hart. I was confident of a clean sheet for Shaw and Hart this weekend. Gutted I didn’t make the Doherty transfer this week instead of after the international break but that’s how it goes. I thought Shaw could get a clean sheet against Newcastle though. Impressed with Wolves again, I may double up with Patricio as well, he looks quality. Exactly the same as me. Can’t win them all but it’s frustrating when you consider a transfer and then it goes the other way. It could be time to bring Aubameyang in, but for whom? Salah is the obvious choice for me. Salah’s form is concerning but I don’t think I’d want to take him out for Aubameyang just yet. The two players on my radar to possibly bring in this month or next (after my goalkeeper swap) are Richarlison and Lacazette. Richarlison playing as a centre striker for Everton seems just too good to resist for a midfielder, especially at that price. Basically a cheaper Arnautovic. With Sigurdsson now firing on all cylinders and the introduction of Bernard supplying him, he could score a very healthy amount of goals. I’d probably have to lose Maddison for this to happen though which I don’t like to do in all honesty but I just can’t resist Richarlison playing up front. Not as convinced yet with Lacazette as I’m not sure who I’d remove out of Salah and Kane. Obviously Salah hasn’t got going but I reckon he will soon. I’m more concerned with Kane to be honest with how deep he keeps dropping. So many times yesterday there were often one or two players playing ahead of him on the pitch. Not where I want my £8m striker to be in all honesty. Lacazette is excellent value playing as the central striker for Arsenal and he’s taking those chances now as Arsenal seem to be shifting through the gears. None of the above is set in stone just yet I’m just going through my thought process out loud to gauge reaction from you good people. I must admit when I saw Richarlison starting up front I was slightly concerned but it’s a tough one. I don’t think I’d want him and Maddison but I’d probably favour Richarlison over Maddison if he’s playing up front. I’d agree with you on Lacazette – not 100% convinced yet but for his value he’s a great option. Could be a good one to bring in if we think getting De Bruyne in is going to be essential. What’s our overall thoughts on Salah? Stick with him for now would be my personal opinion as they’ve got some decent fixtures approaching. Yeah, with the fixtures they have on the horizon I think he should stay for now. I’ll review again though once this period of easier fixtures is done with, same goes for Mane as he’s started blanking too. As I said before I’m concerned about Kane too. I do wonder however if things will pick up for him once Alli and Eriksen are back in the equation though. Both expected to be back after the break. Yeah I’m hoping Kane will pick up as well. He should do but you never know. I think for this month I’ll have to focus on getting rid of Hart, Shaw and B. Silva first. Wow, listened to the Liverpool City game on Five Live and it sounded very dull. Having Robbo, Gomez and Mendy meant some returns though I guess. One thing that heartened me about Gomez is his versatility and it sounded like he had a good game at right back even getting forward well to support the attack. He’s always going to have a good chance of game time when fit I reckon from now on. 54 points for the week, nothing special with the big guns up front not scoring well but most importantly none of my ML rivals were able to make up any ground either. How did the rest of you fare this week? 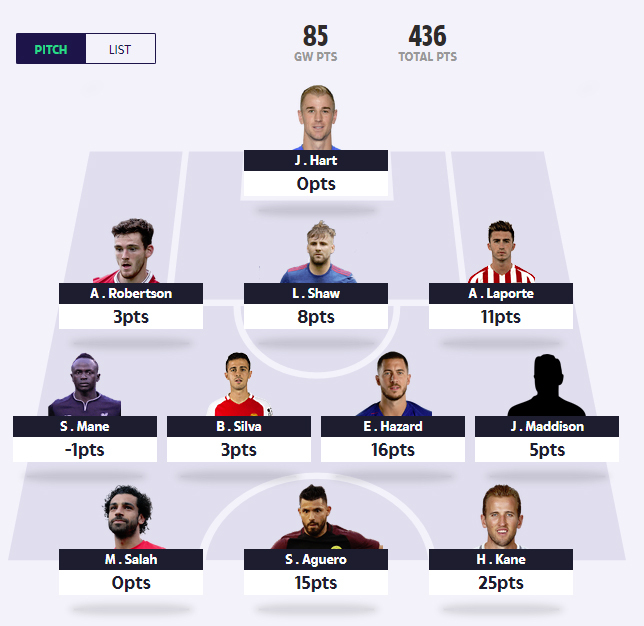 I had a really bad game week – only 26 points. Which is odd considering it’s the same team that carried me up to around 8,000 in the overall leaderboard. I think a few changes will be required after the international break – I’ll be looking at Hart, Shaw and B. Silva to come out potentially with the likes of Leno/Kepa/Patricio, Doherty or Richarlison on my list to look at. I think those three transfers DTT would improve your team immeasurably. You should as baffled as me though we deciding which keeper to go for. 🙂 Just can’t make my mind up at the minute. Having looked at it again, I’m liking Kepa as an option. Potentially taking out Hart/Shaw/B. Silva for Kepa/Doherty and one other (Gomes/Richarlison maybe). I might even be able to stretch to Ederson but I’ve always stayed away from expensive keepers traditionally. Took 30 points this weekend so not good at all. Moura has been terrible since putting him in last transfer window. He’ll be getting the axe after the international break. Gomez will take his place I think as I expect Liverpool clean sheets after the break. I also really like Richarlison as an option the same as you lads but it will have to be with the November transfers. So I’ll monitor him until then. Also Shaw and Hart will get the chop and I’ll be looking at the Wolves pair Patricio and Doherty. I wanted to make the change this weekend but I just thought Shaw and Hart could get another clan sheet before doing so. That wasn’t to be unfortunately. I was swaying towards Leno for Harts replacement but I just can’t see Arsenal getting too many clean sheets, I know they had two recently but they were lucky clean sheets if you will. Can’t argue with those replacements mate. This keeper situation is a tough one to call with who to go for. Yeah I tend to agree about Leno, there’s also the issue of what will happen when Cech returns. I like the look of Kepa at Chelsea though, considering he’s playing in the Europa League as well. I’m not sure about doubling up on Wolves defensively. I like the look of both Doherty and Patricio but not sure I’d want both in the same team. I’d probably favour Doherty purely because he’s cheaper. I have 2 transfers left and also want to shift Hart and Shaw out, but finances are tight. Thinking Leno and Doherty. I would like Kepa but cannot afford him, but I like both Arsenal’s and Wolves fixtures and how they’re currently playing. Next window I’ll be looking closely at Salah and Mane. A very strange game week and not in a good way!! Whilst most in my ML managed to accumulate around the 50-60 point mark, I suffered another poor week with 26 points!! Mane is now -1 in the last 5, whilst Salah is 11 points from his last 8! That is so very poor!! I know they are likely to turn a corner soon…. no doubt as soon as I take them out, but I’ve lost all patience with Salah now!! I will be removing him after the international break! Agreed the Mane and Salah form is killing my league position. Both to struggle like this is very unfortunate tbh. It is a break now so it’s time to regroup and think about transfers going forward. They’ve got some decent fixtures coming up for the rest of the month as well. Who are you going for Lee? Aubameyang? Lacazette? I’m going to give Salah a little longer with good fixtures but I completely understand your stance as well. I’m not sure at the moment Chris? It feels like I’m chasing shadows so far this season!! I keep missing the boat on players I want to bring in (but haven’t) such as Wan-Bissaka, Wilson and recently Doherty. B.SIlva – Brought in for GW2. He scored 3 points in 3 games so I took him out (to accommodate Hazard)…. He then scored 26 points from his next 3 games!! I’m tempted to bring in Lacazette, but the way my season is panning out, he will dry up whilst Salah goes on a scoring spree. That’s the game sometimes, I guess, but so far my season is just dreadful! Sitting down in 8th in my ML on about 430 odd points!! Sometimes you can only put things down to bad luck. This comes into play a lot more than it’s talked about. Injuries or suspensions in particular when you’ve just transferred a player in is something you can do absolutely nothing about. Are you definitely going to take him out? I think they play Huddersfield, Belgrade and Cardiff next which is why I’m hanging onto them for now. It makes perfect sense to hang onto him for those games and I don’t want to do anything rash since catching my deficit is going to be hard enough as it is, but I can’t help thinking that my team could be so much stronger in other areas (Hart, Shaw, Pedro). I’m effectively holding on to locked value in Salah who isn’t earning his worth in that value. He who hesitates…! Very poor gameweek although i wasn’t expecting huge points given 6 of my 11 are City and Liverpool players. Disappointed for Kane not to score against a poor Cardiff, and Hart’s blank confirmed it’s time to go. My biggest gripe is my lack of balls in making transfers in my main team, this week being Wan Bissaka for Doherty. That would have been a huge swing in points but I held the transfer until after the international break. Hindsight is a beautiful thing. I could’ve made the transfer and watched Palace keep a clean sheet so not going to dwell on it. Thoughts for transfers after the break assuming no injuries? Below are my initial thoughts but of course this could all change. I’ll no doubt change my mind by then. No Man City or Chelsea representation in my GK/Defence could be a mistake. But I’ll struggle to accommodate without dropping a big points hitter. This would be Salah but I’m giving him till the end of Oct.
Another potential transfer is drop B Silva for Richarlison, but this does mean losing out on those European games. I reckon the most difficult thing to do playing Dream Team is timing your transfers right. In all honesty, Palace playing at Home to Wolves, I’d have probably took the same stance as you with Wan-Bissaka. Just the way it goes bud. Are you set on Leno Dave? I’m still not sure who to replace Hart with. I like Arsenal’s fixtures, I don’t like their defence. I’m also questioning Leno now. If they had kept a clean sheet at the weekend I’d have probably been sold on the idea but they haven’t been great at the back. Kane was the biggest disappointment for me but holding the transfers panned out pretty well last month but I’m the same as you when it comes to not making transfers which seemed fairly obvious in hindsight. Transfers look fairly solid – could you afford Kepa instead of Leno? I’m also giving Salah until the end of October. Kepa would require greater savings, possibly from either Mane / Salah (bringing in either Richarlison or Laca). Tough choice! Expect the price movements on Friday to make it more difficult but they won’t be huge swings, so I’ll leave until after the break. I’ll be leaving mine until after the break as well. Personally I wouldn’t touch Mane or Salah for now. My team had a decent week. Got 48 points. Team still struggling in 421 points but I feel it is slowly moving in the right direction. Now ranked 161k after being ranked 281k in the last international break. Despite the bad start, I am enjoying the game. It makes me harder at my game, spend a lot of time looking at differentials. Got a lot of work to do over the next two weeks. On the subject of goalkeepers, my teams have either Ederson or Alisson. My strategy usually involves having an expensive goalkeeper but these two I like because they play most games, have very good defences in front of them so they don’t concede many shots at goal plus they are really goal good goalkeepers. Ederson surprisingly has assist potential as he provided assist for Aguero goal vs Huddersfield. The same move nearly paid off in the last champions league game but Aguero hit his powerful effort just over the bar. Plus City rotate their defenders – Mendy for me has fitness issues and him and Sane can’t seem to play in the same team which could be a problem for both, Walker good but 4.9m other cheaper attacking defenders around (did the move from Walker to Doherty this weekend which paid off), their centre backs Otamendi, Stones and Kompany can’t be selected with confidence. Liverpool have got good fixtures coming up so Alisson might be worth investing in. A few questions now surrounding the Liverpool defence: is Trent Alexander-Arnold a rotation risk, yesterday saw Gomez at right back so Liverpool have three right backs in TAA, Clyne and Gomez. I was all set to bring TAA as he takes set pieces but now might to look at more expensive Virgil Van Dijk. One thought is doing Maddison to Van Dijk in my team. But will mull it over the international break. I like the logic of having a keeper like Ederson who isn’t going to be rotated. I’m happy with Laporte at the moment but can’t see any harm doubling up with City at the back. I also like the look of Kepa for the same reasons. I think Doherty is a good bargain so this might make the case for me having a more expensive keeper for a while. My main worry is having too many players who don’t have those additional fixtures – if I were to lose Shaw and B. Silva I’d be slightly concerned if I bought in Doherty and someone like Richarlison due to having less fixtures. I think I favour Ederson and Alisson as they offer great security to my defence – I don’t suffer many minus points with these two. Also I like to play with at least City or Pool defensive assets that are not subject to rotation. Plus I can leave them in my team and use transfers elsewhere. Also I would be wary of taking out players as there are still champions league games to consider. I think wolves only have two games left and their fixtures turn tough in November. Honestly I think the boat has sailed past on Doherty – he won’t be picking up 18 points every game. His goal was a shot that the Palace keeper should have saved. Everton’s fixtures are a right mix of good and bad plus they are out of the league cup. Plus sigurdsson looks to be the one on top form. Kepa is good but I am not convinced by Chelsea’s defence, watching the saints game on the weekend, they looked fragile at the back and conceded a high number of chances. Although I do like the look of their defenders Luiz (cheaper at 3.3m)and Rudiger as they do offer an attacking threat. I disagree, whilst Doherty won’t be picking up 18 points every week ( Nor will any other defender ) Wolves still look as solid as anyone else I’ve watched. Don’t forget they have been toe to toe with City and United so far and conceded 2 goals. That’s not bad at all, we saw with Burnley last season smaller teams can also keep clean sheets. I wouldn’t say the boat has sailed with Doherty – although I can absolutely see your point. It’s a similar situation with Hazard. I missed his hat trick but it would have been the wrong move to then leave him out. He’s gone on to score well regardless of me being a week late. Doherty obviously isn’t in the same bracket but at less than 2m he’s in a team who should finish in the top half of the table which makes him good value. What an abysmal weekend, I have now fallen 75pts behind in my mini league, two teams at top have 4 of Chelsea’s back five, I have Alonso, but not enough to nullify them, at odds to know how to bridge that gap, only have one transfer left this month, will have to be Gomez, as they have Huddersfield Cardiff, & Red star Belgrade, I am 0.2 million short of Kepa, who also played last game of Europa league, they normally rotate their defence & bring in Christenson, Zapper Costa, & Cahill, I also missed out on Doherty, giving Shaw 1 more game, as mentioned they only have 2 games left this month, & are out of league cup, as for Arsenal players, wouldn’t touch their back line, always get let down Aubamayang & Lacazette beginning to fire now, but will probably start on bench for Europa league, until latter stages of tournament, as for Richarlison, only 2 games left this month, next month 4 games, which includes Liverpool & Chelsea, although he could be the spearhead now. Thinking of going a bit maverick for my next move. I just can’t get Richarlison out of my thinking now it looks like he’ll be the spearhead as DK points out. I’ve been looking at ways to get both him and a replacement keeper in vs just a replacement keeper. The option I’m beginning to warm to is 2. I was impressed with the way Brighton were able to keep a much improved West Ham at bay after taking the lead. Looking at their fixtures during the next five weeks I see other possible routes into clean sheets. The thing I admire about Brighton as one of the smaller clubs, is that they offer a decent attacking threat unlike some other teams (Newcastle, Burnley etc). With Murray rolling back the years and Knockaert looking impressive this could help ease pressure from the defence against some of the easier sides they’ll face in the coming weeks. Is this a Eureka moment of inspiration or have I just gone as barmy as a Steve McLaren interview when he tries to sound Dutch when speaking English?! PS Feel free to add your own keeper/midfielder combos. I’d personally probably go for option 1. I’m not overly convinced by the other keepers – when I take Hart out I’d hope it’s going to be for a significant upgrade. I can’t even say I’m overly sold on Leno at the moment. Hi Chris, would probably lean towards option 2 aswell, but would prefer to select player’s regularly playing in Europe, & perhaps still in league cup, difficult to find when you are scrummaging around a little in the bargain basement, Barkley could get a run in Chelsea team now, Ramsay is another capable of being a goal scoring midfielder, how many pts are you on, I’m chasing down guys on 520 pts, with Chelsea blocks, killing me at the moment. Currently on 478pts. Next team down in my ML is on 445. With regards to the European argument, one thing that’s really struck me this season is how many below par performances at the weekend I’m seeing from players who’ve played the Europe in the week. Not very many players have shone in Europe and the PL in the same week. I would guess that will probably change at some point but it’s an observation worth pointing out. It’s also very difficult to pin down a player who’ll play in both the league and Carabao at this stage. Way too much rotation to get any guarantees. Chris, I like the Brighton analysis. I put in Ryan in one of my teams on Friday evening. I’m not a big fan of cheap goalkeepers as you may be aware (my real life feelings for Joe Hart puts me off from picking him in fantasy football) but Brighton’s run of fixtures were difficult to ignore. So I spent quite a bit of time looking at their players (I tend to look at all players in the game not just the top 6) but ignored their attacking assets as their biggest strength lies in their defence. Last season they kept 10 clean sheets which was good for a promoted side. So looked at their defence: Duffy I like the most but no way paying 3.2m for him when other defenders like D. Sanchez cost 2.6m so that ruled him out, next Dunk was an option but he has history of own goals, Bruno been rotated and Bong basically offers no attacking threat or any hope of 7 rating. So that just left Ryan. I think that the fact he conceded only a maximum of 2 goals in difficult games impressed me. Also the fact they didn’t get trashed by City (which is common for many away teams) added support. I think right now Ryan is a potential bargain at 1.5m. First mention I have seen of Ryan, nice to see differentials being mentioned. I think they are over 200 players in the game but most will look at a small percentage. Sometimes it’s worthwhile (and more interesting) to broaden our horizon. Just out of interest, today looked at the top 50 teams on the overall leaderboard and the template team based on their selections is as follows: Ederson (3.9), Luiz (3.3), Alonso (5.2), Laporte (4.0), Robertson (3.7), Maddison (2.0), Sterling (6.2), Hazard (6.6), Kane (7.8), Aguero (7.0) and Aubameyang (5.5). Unaffordable at 55.2m and originally priced at 51.5 but interesting that Salah is only in 4 of the top 50 teams. So could be a differential. This also adds further weight to my statements above about looking at an expensive goalkeeper. Ederson is in 17 top 50 teams with Alisson in second place with 14. Might look at the next 50 teams next so have overview of how the top 100 teams look. Whilst Salah may not be owned by many in the top 50 teams, he still has an ownership of over 50% so any upturn in fortunes for him would see a lot of sides rise up the overall standings. I just can’t afford a top keeper with the players I want in my outfield. If the time comes when one of my so called “big hitters” makes way for someone like Lacazette, maybe I’ll travel down that road. I think you’re sharing the same Salah headache that I am. Dropping him can result in improvements all over the squad but you just can’t help but shake that feeling he’ll bang them in soon. I think the next 3 games will be a huge determining factor over where to go with Salah. We really should be looking for a big return, and more. I know it’s frustrating but I believe he’s got roughly the same stats as this time last year. Could easily change quite quickly. I’d agree – I’d rather have Salah than have to downgrade him to get someone like Allison. At the moment anyway – if his lack of points continues I could be tempted. Great work there RR, them stats are very useful to me and have given me more of an idea of what my team needs to be looking like. I’d keep hold of Salah for now. I’m just hoping loads take him out and then it comes back to haunt them. I think Ederson is fairly good value. I personally just try to target the cheapest defensive option for a team I like for clean sheets. For example I’d rather have Robertson over Allison, I’d rather have Shaw over De Gea (before the season started that is), Doherty over Patricio but appreciate there’s a case for have a strong keeper. I think the top 100 also reflects that Salah and Kane have been a bit hit and miss this season. Had they both scored big big points then I think the top 100 would look very different so this could change. Different ways to play the game but with defensive players I usually have at least two from the same side. I would have Alisson and Robertson or Ederson and Laporte. Now I seeing teams in my mini league going with both Luiz and Kepa. My highest team has Boly and Doherty. Analysed the top 100 now, only one change to template team: Mane comes in for Sterling. Analysing my keeper options on the train to work this morning (my obsession is becoming unhealthy 😂) and as much as I want Kepa, I simply cannot afford him without losing one of the big guns. An alternative is to have Chelsea representation in the defence. What are people’s thoughts on Luiz? I really didn’t expect him to have the game time he’s had so far, and has a modest 39 points from 9 games. Only £3.3m and bar Man U, Chelsea have a run of fixtures which have the potential for a few clean sheets. Dropping VVD for Luiz gives me £3m for a keeper and gives me variety in the defence. Luiz is a decent option I think. I may look at him myself if I can’t get Kepa in. Had a poor game week similar to many here for being cautious and holding back on transfers. Still intending on doing these transfers and was wondering whether to do them now to beat the price rises on Friday. Thoughts? Can I beat the price rises if i make the changes before Friday? Will have to juggle Kdb in november. You should beat the price rises and I’ve been very tempted to do the same. BUT you run the risk of injuries over the international break. Good changes but I’d be slightly cautious of doing them before the international break. I think they will be locked in and if anyone gets injured on international duty you won’t be able to reverse them. I think the players you are transferring out are the right ones. Leno could be a gamble but most of the keepers are to some extent except probably Allison, Kepa & Ederson. My plan is to keep Salah in agreement with most, over the fixtures. However the potential boost in a better all round team if I decide to take Salah out is interesting. I can potentially upgrade Hart and Shaw which looking at it would be the two I lose. What’s the opinion on De Bruyne? For possibly a Mane or again a Salah trade? I may do this in November but not at the moment. I think having both Mane and Salah is a bit over the top given their current form but I like their upcoming fixtures. I believe Salah will start firing after this international break and the teams at the top currently will lose ground. They have some good opportunities in terms of fixtures over the coming months so I will stick with him for now and maybe re-visit again depending on how he does up to the November transfers. I do however like the thought of upgrading elsewhere by potentially swapping him for Lacazette/De Bruyne. De Bruyne could become essential but he doesn’t score as many goals as Hazard or potentially Sterling so it’s an interesting one. I’m sitting on the fence about Ryan though. Yes he only conceded two against both Utd and City, but it’s also worth pointing out that they have conceded two against 6 of the 8 sides they’ve played, including Watford, Fulham and Soton. The clean sheet against WHU was their first of the season. Granted, their fixtures look decent right up until GW16 in December when they face a top team in Chelsea, but if they are conceding 2 goals against Watford, Fulham and Soton, there is no reason they won’t leak against sides such as Wolves, Everton, Leicester and Palace who they face soon. As for KDB – I have found historically that he is very much hit and miss! There have been times when he has been essential in your team, but conversely I can also recall times (2016-17) when his price dropped so low (to something like 3.5 – 4m) towards the end of the season, that I was stuck with him and couldn’t afford a decent replacement, although much like Mane his average form and ratings are usually quite good in spite of the their poor patches. Wanted to transfer in Leno, Luiz , Doherty for Hart, Wanbasaka, Shaw. Planned to do it straight away but decided to hold on till after internationals. Just wondering if I did the transfers before Friday, would I beat the price rises? The above transfers only work on the current prices and I am on a tight budget! You guys think I should transfer these guys in still? Also looking at Rob Holding who has been a regular starter for Arsenal and at 2.1m seems worth a punt if he holds onto his spot. Also now thinking of doubling up on Liverpool defence by bringing in Gomez. Yes, you have until Friday to beat the price rises. I’d be apprehensive about injuries during the International break, but that said, they look like sensible changes to me. Shame you didn’t do them last week! I’m not sure whether Holding is sure to hold his position as yet. He has only played 6 of Arsenal’s 11 games so far this season. Fraser owners – Worth keeping your eye on this. Interesting, DTT just needs to bring in Firmino then that’s Liverpool’s penalty takers covered. Never been a huge fan. He’s one of those players who already does OK but he doesn’t seem to have that explosive spark that the likes of Kane, Aguero and Salah have had in the past. I’d welcome Mane or Salah on the penalties. Rather Firmino didn’t take them though. What do people think of Begovic? Bournemouth have decent fixtures and not the worse goal difference. If I was to transfer him for Hart that would leave me funds to bring in Gomez and Luiz for Shaw and Wan Basaka. Also leaves me 0.2 to bring in Kdb for Mane in November. Proper headache, all this tinkering could leave to paralysis by analysis! You get what you pay for I guess. Regarding fixtures, bear in mind that he hasn’t featured in the league Cup so far. That leaves Southampton at home and Fulham away before Man Utd, Arsenal and Man City in the space of four games. I think Bournemouth leak too many goals historically for me to consider him. Wouldn’t really see it as an upgrade. Only one transfer left, trying to save 0.2 million, by taking out Shaw & putting Gomez in, before Friday, risky but thinking I’ll go for it, hoping Gomez doesn’t get game – time for England. I’d rather have Gomes than Shaw at the moment so could be a good move. Looking at the fixtures Shaw will have to go, I’m predicting he won’t be keeping any cleansheets for October. Seems like Liverpool have decent fixtures. City have Shaktar then Spurs could be goals incoming for them? This forum seems to warning up nicely now gents (and gals if there are any) with many more beginning to contribute than at the beginning of the season. Great to see! Plenty of great opinions going round too. I’d have a go myself but working continental shifts and also having two young kids I think I’d find it too difficult to commit. Loads of FPL ones out there but none specific to DT. For anyone who is interested, there is a great little app called Anchor where you can record your own podcasts and get them out there. I’m sure there are probably many others too mind you. Thats a decent idea Chris especially people with the time. Certainly will get dtt a potential bigger crowd or interest. It wasn’t until last season I started to contribute. The comments are always helpful on here and of course useful tips from dtt himself! On a side note I’m thinking Hart and Shaw won’t score any points for Oct so I need to shift them? Possible wolves players incoming. I really want to hold onto Salah and Mane still. I reckon that’s a wise move on both counts mate. Burnley’s and United’s fixtures become less favourable over the next few GW’s so probably a good time to ship them out. Although they did well to come back against Newcastle, I’d still be surprised if Mourinho was still there after Christmas. I’ll be trying to move Shaw and Hart on I think. Makes sense given their fixtures and better options around for the same price. Really happy with the level of contributions coming through. As always happy to bring anyone else on board if anyone wanted to submit their own content. I personally wouldn’t have the time for a podcast but would be happy to share/promote anyone else doing one. I’d favour Liverpool with the fixtures they’ve got upcoming. The only real cheaper option is Gomez and is he a rotation risk now? Does anyone know if Shaw and Pedro will drop in value this week? I’ve given up trying to work out the value adjustments Dan. I reckon the algorithm they use for it makes the hadron collider look like a piece of p**s.
I think it takes into account much more data than simply last weeks points score. I’ve had Kane score and get star man one week only to then drop in value and other players who’ve earns zero points and risen in value! Agree with Chris, however whilst you cannot predict it with any certainty, you do (over time) develop an idea of how ratings might go. Either way, neither will rise…. That’s another issue with hanging onto Shaw and Hart tbh they are likely to drop in value to. Dtt wouldn’t it be wise in saying Shaw and Hart realistically aren’t going to accumulate any points for the rest of October? And should be replaced now rather then waiting? I’ll be moving them on but after the international break. It’s impossible to predict anything – their values could drop and players I want to bring in may rise but I’d rather that than lose a big name due to an injury in training or while on international duty. For me there’s no real reason to rush. I’d agree – can’t see either rising in value this time around. Shaw going for Doherty as he will continue to rise based on averages.